Limited tickets still available to buy for London premiere! Bobby Fischer Against the World is the brand new film exploring the complex life of the troubled genius whose charisma and talent spurred a worldwide fascination with the “game of kings.” Fischer’s evolution from his childhood to chess prodigy, global superstar, angry recluse and finally fugitive from the law, is a spellbinding story of the making and unmaking of an American icon. 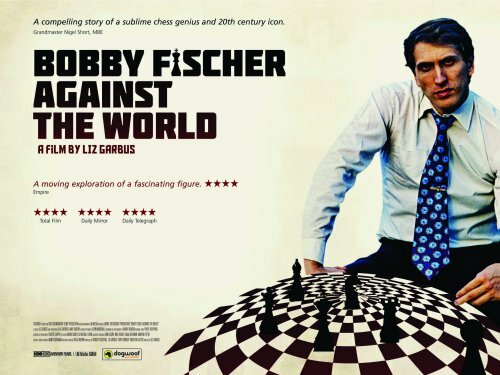 Tuesday 5th July will see London's Rich Mix host the long-anticipated premiere of Bobby Fischer Against the World before its official release, 15th July. Dogwoof are thrilled to announce the attendance of Grandmaster Nigel Short MBE who will play 20 opponents simultaneously before the film screening. Guest players include world snooker champion, Steve Davis OBE. The event will be hosted by CJ de Mooi of The Eggheads and will close with a panel discussion starring Nigel, CJ, Dominic Lawson and Malcolm Pein. Limited tickets are still up for grabs for this special event.